Located at 254 West 54th Street in Manhattan, New York, Studio 54 was the epicenter of the debaucheries party-world. Inside its gilded walls, all tomorrow’s parties and celebrities romped. The disco balls twirled, the socialites teased, and the artists observed. The music never stopped and the alcohol flowed as in Victoria Falls. Andy Warhol, talking about the nightclub in 1979 wrote, “It’s the place where my prediction from the sixties finally came true: ‘In the future everyone will be famous for fifteen minutes. '” Oh to be a bright young thing in 1979! Image created by me from photos found at The Ian Schrager Development Company – The Nightclub Years Slideshow. 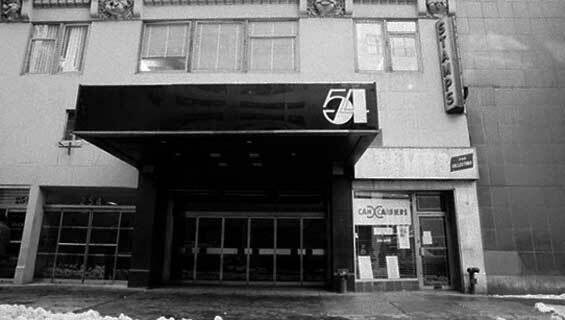 In 1977, Studio 54 was transformed into a new age, spectacular nightclub by Steve Rubell and Ian Schrager, with Jack Dushey as a financial backer. They operated the company as Broadway Catering Corp. It took four months to transform the theater into a nightclub and cost $400,000. Adjusting for inflation, what cost $400,000 in 1977 would cost approximately $$1,502,726.07 in the present (2012). Studio 54 was widely known for its mixture of “regular joes”, “star”, and “notable personalities”. Rubell, Schrager’s creative partner was known for “casting a play” when selecting the people who could enter the club. The floor of the space held around 1,550 patrons who paid a $15-$20 cover charge to “be invited to the party”, nightly. 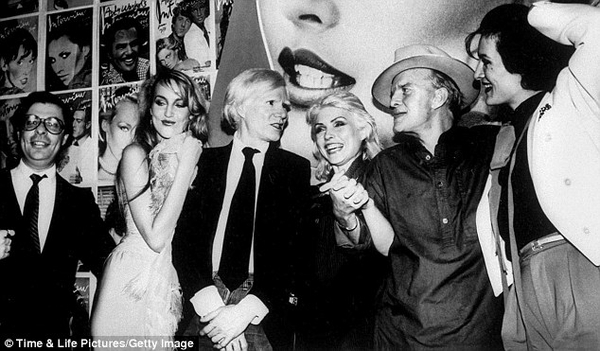 New Year’s Day 1978, at Studio 54 with Andy Warhol, Debbie Harry, Truman Capote and Paloma Picasso. Image found via Jerry Hall, HERE. 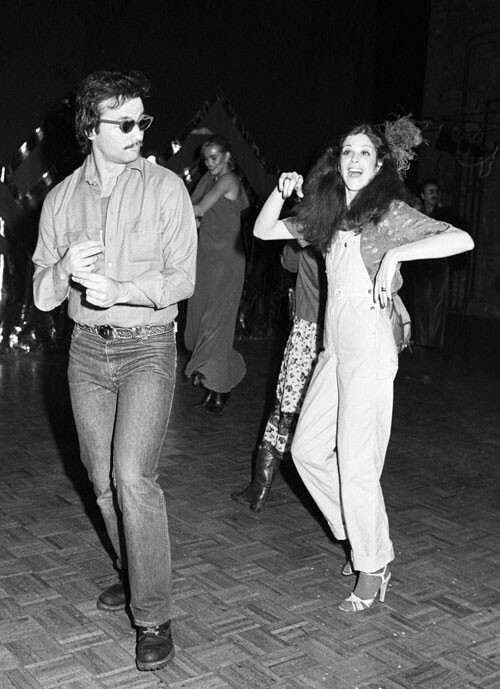 Bill Murray and Gilda Radner, dancing together at Studio 54’s 1978 Valentine’s Day ball. Photograph via WWD from Conde Nast Digital Archive, found HERE. Bianca Jagger and Liza Minelli at Studio 54 in 1978, Photo: Bulls, image found HERE. 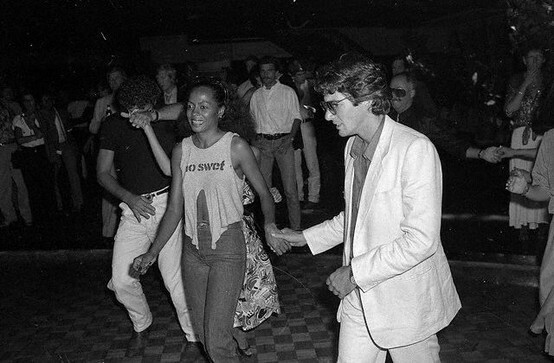 Diana Ross & Richard Gere at Studio 54. From a genius article called “Instant Art: 1970’s Celebrity Photographs”, found via Small Shop, HERE. 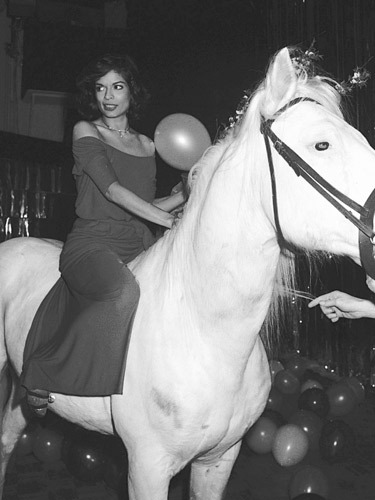 “By far the most iconic image to come out of the most infamous nightclub in living history is one of Bianca Jagger, wearing a sheer, red, off-the-shoulder gown riding a white horse (being led onto the dance floor by a painted naked man!). Staged as a publicity stunt a week after the infamous New York discotheque opened in 1977, legend has it that co-owner Ian Schrager was persuaded by fashion designer Halston, who had created the red dress, to give It-girl of the moment Bianca a special birthday present (she had just turned 30, or 27 depending on who you believe).” – Image and store found, HERE. 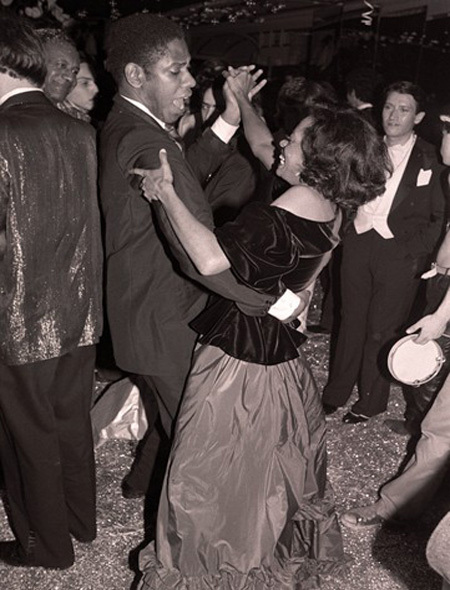 Andre Leon Talley (who started as Warhol’s assistant and is who became KING of the fashion world) and Diana Ross in Studio 54, New Years Eve party 1978-1979. During one famous night four tons of glitter was dumped in a four inch layer on the dance floor. It is rumored that the glitter was found in crevices, outfits, and the hair of guests months later. Photo By WWD Archive, found HERE. On February 4, 1980, the nightclub closed with one final party called “The End of Modern-day Gomorrah”. Image found HERE. Studio 54 has become synonymous with excessive excess and decadence that defined the late 1970s and early 1980s. 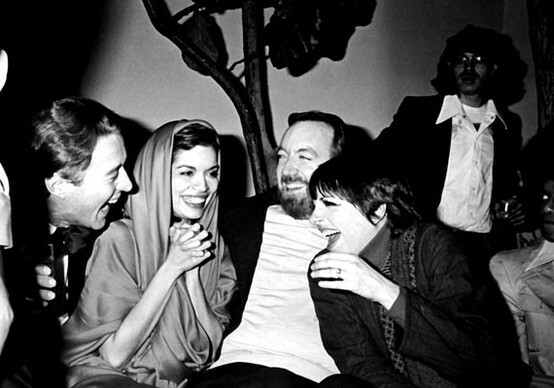 Although drug fueled and liberal, in many ways the era of Studio 54 was a more naive time. Some employees and regulars of Studio 54 were early victims of AIDS, a decade before doctors and the public were aware of the disease. Even Steve Rubell, co-founder of Studio 54, died at the age of 45,of AIDS-related complications.